There’s a frightful clash of the titans set for Halloween Weekend when Dallas takes on Philadelphia at AT&T Stadium. Sunday at 7:30 p.m. Get Cowboys tickets. Find an Arlington sports bar. See what lurks after dark in the ballpark during these rarely-offered night time tours—and keep your eyes open, because you never know just what might pop up. Friday, Saturday, and Monday at 7:30 p.m. Visit the Haunted Tours website for details. They’re baaaaaack. If it’s October, that means fall fun by day and chilling frights by night at Six Flags Over Texas. New additions at this year’s Fright Fest include the creepy Black Widow Walk, a super-scary Blackout Maze, and the amazing virtual reality ride, Rage of the Gargoyles. Be afraid, be very afraid —and definitely don’t miss it. Through Monday until 10 p.m. or later. Find out more. The best ABBA tribute band on the planet is driving the disco train to Arlington, bringing hits like “Mama Mia,” “Dancing Queen,” “Does Your Mother Know” and much more. Head downtown to sing, sway, dance along…c’mon, you know you want to. Wide ties, platform shoes and bell bottoms are optional. Friday at 7:30 p.m. Get tickets. Looking for a grown-up evening out this Halloween weekend? Park your little ghouls at River Legacy Park for an evening of night nature hiking, mystery movie watching, and all kinds of kid-friendly Halloween fun. Friday from 5-9:30 p.m. Find out more. This charming pre-war Noel Coward comedy presents the other-worldly dilemma of cantankerous novelist/socialite Charles Condomine, comfortably settled into a second marriage, whose investigation into the world of the occult finds him suddenly unable to shake the lovely ghost of his first wife. Weekends through Nov. 6. Where can you peruse the Enchanted Mirror Maze, check out the Impossible LaseRace, visit the Palace of Wax, or take in the thrills and chills in the Moving Theater, all in one wonderfully weird location? Nowhere else but the freakiest museum on the planet, of course—Ripley’s Believe It Or Not. Kids in costumes get half-price Saturdays and Sundays in October. Find out more. The UT Arlington women’s volleyball team stages its last stand at home when they take on Louisiana-Monroe and Lafayette at College Park. Friday and Saturday at 6:30 p.m. Get volleyball tickets. What is it about a pumpkin party that just sounds like a ton of fun? We’re not sure, but we’re betting you’ll enjoy discovering why at this afternoon shindig at Legal Draft, which will include a BYO pumpkin carving contest, costume contest, and all kinds of family-friendly fall fun. We’ve also heard rumors that they serve beer at this joint, too. Saturday at noon. Find out more. 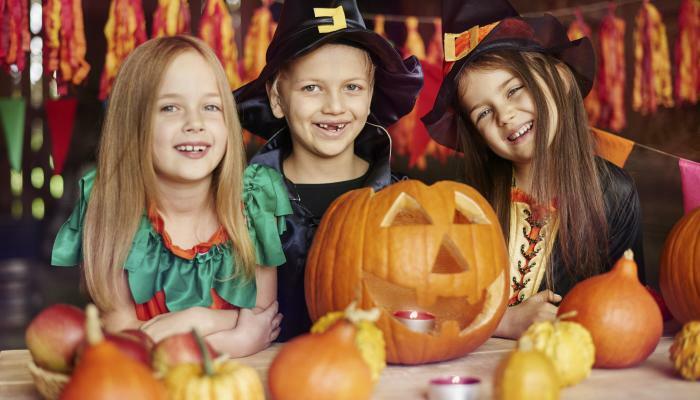 Seven: Set your broomstick for the Mansfield Activities Center, where you and your family can enjoy a hay ride, carnival games, a s’mores extravaganza, fall crafts, and all kinds of old-fashioned Halloween fun. Friday from 6-9 p.m. Find out more. Celebrate the beautiful fall weather with food from a truck in the latest installment of the Food Truck Friday series, held at Founders Plaza. Vendors aren’t announced until Wednesday or later—but we already know Steel City Pops will be there, serving up some super yummy dessert-on-a-stick. Friday at 11 a.m. Find out more. Throw on your best Halloween costume and get ready to do the Monster Mash as Traders Village presents the annual Haunted Hallway, a giant spooktacular for kids and families that features a little somethin’ for everyone —and it’s free! Sunday until dusk. Find out more. Roll in your costume all weekend at Arlington Skatium, where you’ll also enjoy a glow-in-the-dark skate, costume contest, candy grab, and more. Friday and Saturday at 7 p.m. and Sunday at 1 p.m. Find out more. Car wash employees turn off the lights, put on masks and scare kids and grown-ups as they go through the tunnel. So, kill two birds with one stone by scaring the kids, getting your car cleaned and waxed!